News in overnight from Jim Elliott in the Newport Beach office of Ardell that the price of his central agency for sale, the 28.07m Nordic Star has been reduced. A tri-deck custom Hargrave motoryacht built at the Lantana Boatyard in 1969, this is the first time she's been offered for sale in 20 years. 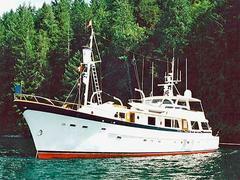 She sleeps six guests in a master and two twins along with two crew cabins and a crew mess. Located in Newport Beach, California, Nordic Star has had a price cut from $1.75 million to $1.5 million.